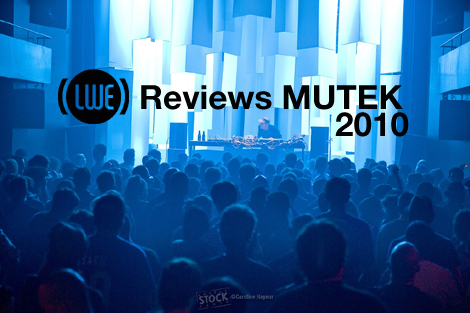 After a few days’ rest, LWE contributor Steve Kerr offers his review of MUTEK 2010. On the week prior to MUTEK, The Montreal Mirror (the city’s main English alternative weekly) ran a cover story on the Còmeme-signed Mexican producer Rebolledo, who was to perform at the festival’s opening showcase. 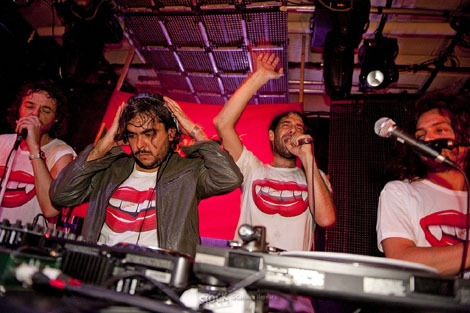 Jack Oatmon, the paper’s clubbing specialist, described Rebolledo as “the antithesis of the stereotypical MUTEK artist… raw, guttural, punchy and simple… not preciously niggling over the minutiae of subtle, minimal techno tracks.” Oatmon isn’t inaccurate in his description, but his words also speak to the widespread perception of the festival as humorless and overly intellectual. 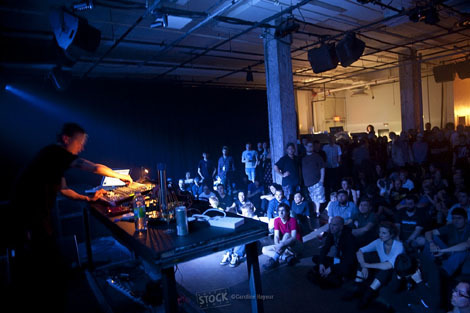 Granted, MUTEK has always prided itself on representing all categories of electronic music; brainy acts like Matmos and Mouse on Mars were included on this year’s schedule, and the festival remains an event for followers of studied, experimental composition. However, the notion that quality dance music and challenging, subtle arrangements are somehow mutually exclusive feels painfully outdated, especially in comparison to the number of iconoclastic artists on the bill. This was the first year I’ve attended that felt relatively cutting-edge, which is largely attributable to the refined lineup and the trimming of dubious attempts at live bands. The festival focuses on live performances rather than DJ sets, and while there were still a few missteps in this respect, the artists generally appeared to have been granted more freedom in how they presented themselves. Still, audiences occasionally seemed unsure whether to dance or chin-stroke, and the flow of certain lineups was marred in equal parts to the venue and the degree of the artist’s experimentalism. On opening night, I headed to the Còmeme showcase at SAT (La Société des arts technologiques), a spacious box with fantastically crisp sound that typically plays host to sound-art and bass music events. I arrived as Diegors’ opening set transitioned into Matias Aguayo’s live band performance, in which Aguayo and Diegors, alongside Vicente “Original Hamster” Sanfuentes, proceeded to jam out on an assortment of hardware and hand percussion instruments, frequently chanting on top. The trio wildly shifted between jacking, tropical house, digital cumbia, and Aguayo’s dream-pop, a blurry mess that was far too much fun to dance to; no doubt a widespread sentiment, judging by the room’s convivial atmosphere. True, it was an attempt at a live band, but it was successful because it wasn’t far from a DJ set, which it eventually became. After awhile, Rebolledo materialized to play a selection of tracks that generally sounded like Skatt Bros’ “Walk the Night,” all hairy motorik motorcycle disco, and almost inevitably the dance floor gained a more masculine presence. The set melted back into another performance from the trio (now with Rebolledo in tow), and again, the combination of DJing and live set was absolutely seamless. Put simply, it was the friendliest introduction one could hope for. Friday’s Nocturne, held at SAT and the neighboring Club Soda, was curated by FACT Magazine and boasted two impressive lineups; the former venue handled the bass-music side of things, while the latter, where I spent most of my time, focused on more techno-oriented acts. Club Soda is more claustrophobic than SAT, and the system suffered from some muddiness, but the night’s true problem was in its fluidity. I got there immediately after Orphx’s set, purchased a hideously overpriced bottle of water, and made my way to the front for Actress. 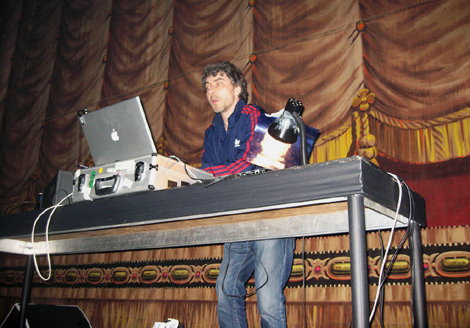 His set, performed via the standard tweaking-apparatus-and-Macbook, was a reasonably smooth mix of tracks old and new. 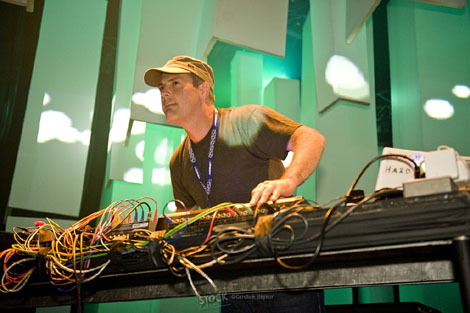 However, it was very much apparent that Darren Cunningham is foremost a producer of headphone music; his more delicate compositions were pulverized by the club’s system, and at one point the sound even cut out. 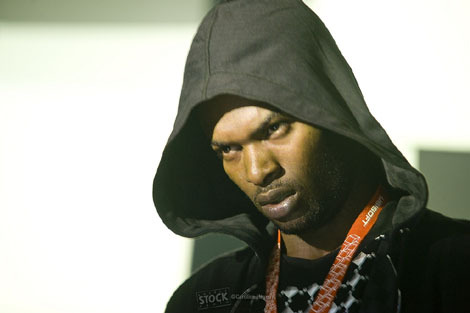 His brooding stage presence — hood up, eyes closed — complemented the downcast material, but the set was too moody to successfully kick off the evening. It may have made more sense to put him on in a more intimate setting, with more effort on the visual front. After a pause, Cheap and Deep’s Jay Ahern materialized behind a table crowded with hardware, removing his sandals and launching into a set of athletic techno. Almost immediately he convinced a good portion of the crowd that it was already peaktime — frenzied shouts erupted, a friend ran up to give the producer a hug — people were happy and dancing. But because Ahern started so intensely, there was very little to build on, and after the initial thrill, the assault of raw, rhythm-heavy tracks began to wear. It was too much, too fast. 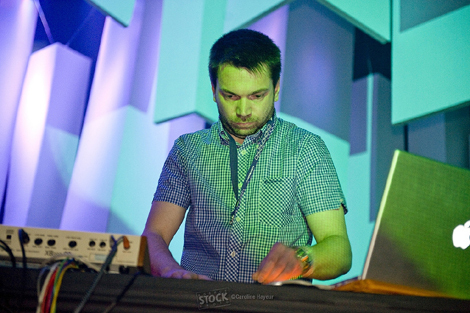 Another energy-decimating pause and Jacek Sienkiewicz began his laptop set, which, in spite of some comforting atmospherics, also lacked momentum, though for entirely different reasons than Cheap and Deep. 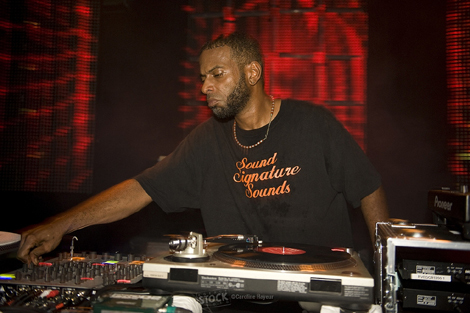 His tracks were too minimal for their own good; one cannot move a crowd by simply dropping in and pulling out the bass. The dancers appeared to feel the same way too, moving lethargically, like they were only dancing because they happened to be in a club. Sienkiewicz’s tracks may work in the context of a DJ set, but played live, there simply wasn’t enough substance to warrant enthusiasm. Already on the edge of the dance loor at this point, I left to check out what was going on at SAT. A fog-shrouded King Midas Sound were starting their last song, an apocalyptic thrashfest totally removed from the weeded melancholia of their releases. I had to remind myself that this was Kevin Martin, after all, and the fans were there to experience bassbins pushed to the extreme. A little too intense for my tastes, but it was nice to have my expectations jarred a bit, which is part of the beauty of MUTEK. Back at Club Soda, Shed had the estimable task of redeeming everyone’s night, which he absolutely did. Running through material from his various aliases, his tracks felt especially warm after the austerity of the preceding acts. People were going nuts the entire time, and the unassuming Berliner received a star’s ovation. He looked floored –and awkwardly apologetic –in response to the ubiquitous encore request (which unfortunately never came, as he was promptly cut off at three o’clock), gingerly closing his laptop and shuffling offstage. Again, I left the club beaming. On Saturday, dissuaded by inclement weather from attending the Piknic (which featured DJ Koze and Minilogue, among others), I dropped by Vladislav Delay’s set at SAT, where the crowd was markedly different from those of the dance events I’d been attending;although I wasn’t expecting a throbbing techno performance, the collection of stiff, serious people sitting on the floor was still sort of a shock. The set was reflective of his recent material, an abstract bassy clutter with quick glimmers of beauty. I sat down and thought about how James Blake might be doing pop takes on that sort of thing, and then it was over. As much as headliners Tim Hecker and Ben Frost held interest for me, I wanted to give my ears a rest for Move D, who was to perform later that night. Metropolis is one of Montreal’s catch-all venues (accompanying MUTEK on the marquee were George Thorogood & The Destroyers), a large space with a balcony and reliable sound. The early crowd, regimented into a side-street line by young, stressed-out bouncers, was noticeably brightly-colored and druggy. With headliner Dixon slated for a four o’clock timeslot, people were quite ready to dance all night. As David Moufang opened his set with a luxuriant ambient passage, someone loudly requested that he “drop the beat!” — which he proceeded to do, and quickly everyone in the room was hypnotized. As with his releases, one gets the impression from his labyrinthine live set (again, laptop-and-controller) that he could go on jamming forever; he’s truly a master at improvising on top of grooves that expand and expand. It’s also worth noting that Moufang had by far the coolest stage demeanor of any performer — right at one of the set’s peaks, a look of intense concentration gave way to a wide grin, and he casually danced over to the side of the stage, as blissfully lost in it as the rest of us. Afterwards, I couldn’t help thinking about how well Move D could have complemented Shed’s set, though like Shed, he was outstanding on his own. It was raining hard enough on Sunday to warrant a move of the day’s Piknic from Parc Jean-Drapeau (located on a neighboring island in the St. Lawrence River) to Metropolis. San Proper was playing repetitive, clattering tracks to a sparse, reasonably enthusiastic crowd when I arrived. After nodding my head a little bit, I went to find the coat check, only to be informed that there wasn’t one — not a big deal, but it made things a little uncomfortable, especially when Pépé Bradock took over for a DJ set. As expected for someone with his track record, Bradock is a consummate professional on stage, immediately locking into a set of loopy disco house; the dance floor immediately got dense, people were appropriately sweaty and psyched. His tendency to throw everyone off guard with sudden bursts of incongruous noise was also appreciable. Later that night, I headed to SAT for the final Nocturne. 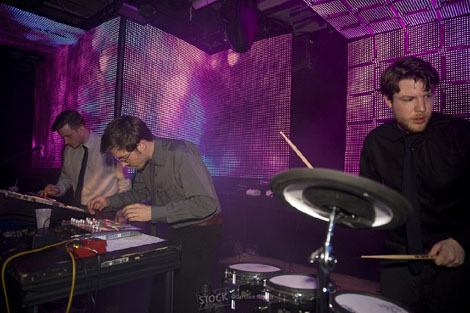 Brandt Brauer Frick, who began late, were basically a Krautrock jam band — incredibly tight, perhaps too tight for their own good — whatever funk they had was canceled by the palpable excitement for Theo Parrish’s closing set. 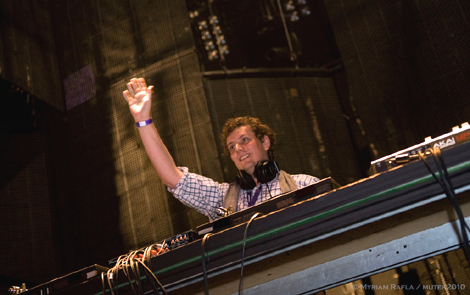 After a slow start punctuated by some unpleasant feedback, Parrish launched into one of his classic sets. Gritty and filled with otherworldly equalizer tweaks, he ran through Mr. Fingers, Fela Kuti, James Brown, and the Police, exposing the house at the heart of everything. His raw style was definitely polarizing; there were a lot of folded arms and glum looks (and unfortunately some of these people forgot to clear the floor), but most everyone else was going crazy, begging for more when the lights were turned on around three o’clock He concluded things by barking one of his infamous speeches about being a specialized vinyl operator (I wasn’t close enough to hear, but I got the gist). While this was easily the best MUTEK I’ve attended, I hope the festival’s organizers take note of Parrish’s words. There was very little in the way of Oatmon’s boring, hyperdetailed minimal techno, but I see room for improvement in providing rawer material, phasing out the Ableton sets in favor of more uncompromising live presentations. A classicist, all-vinyl DJ set would have been a welcome substitute for certain dead-end laptop excursions. I have to digress, though. Aside from the occasional problems, MUTEK did a wonderful job of showcasing some of electronic music’s most revered names. Almost wholly ignoring the more ambient and experimental side of things, I was still able to catch a broad swath of talent in some well-chosen venues. As long as organizers continue to place originality above what’s fashionable, the festival has a bright future ahead of it. You missed Mossa, Attentat, Konque and some others and did amazing. Pepe Bradock was a total hit, what a boring Dixon we had over there. Mutek is an amazing festival overall.